-Simple and durable wireless charging pad works for the mobile device equipped with Qi standard charging. -This wireless charger is compact, portable charging wirelessly at home, office and other locations. -Simply connect it to a power source and place your Qi-enabled mobile device on the wireless charging pad. -You can still use your device while charging and answer a call without having to unplug. 1.Please take off the thick phone case (thicker than 5mm) and the phone case including metal parts, like magnetic pad, metal ring, etc. 2.Make sure your device is placed on the center of the charging stand for a best charging effect. 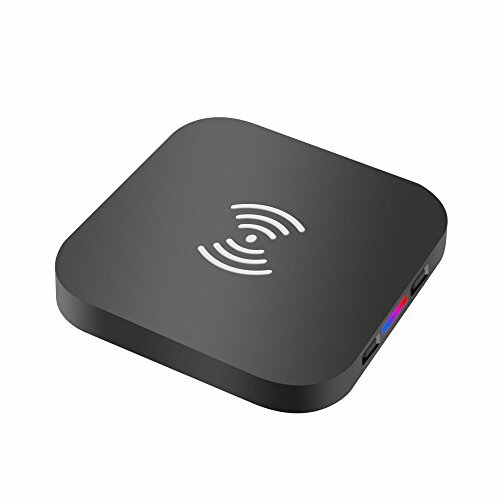 3.If your phone without Qi wireless charging function, please connect with a Qi-Enable receiver. 4.This wireless charger just supports standard charging. Wireless Charging: This wireless charger utilizes Qi inductive charging technology to works for all Qi standard devices. No cables needed, just place devices on the charger pad and you can enjoy the cable-free convenience. Wide Compatibility: The wireless charger is compatible with all QI-enabled wireless charging devices such as Samsung Galaxy Note8, S8, S8+/S8 Plus, Galaxy S7, S7 Edge, iPhone X, iPhone 8, iPhone 8 Plus, etc. It can also apply to devices with QI receiver. Ultrathin Design: Super slim charging pad, 0.35 inch thickness, generates less heat and provides more sufficient charging. Compact appearance makes it portable, lightweight and practical, suitable for using at many locations. Safer Charging: Smart chip built inside, which prevent the wireless charging pad from overheating, overvoltage and short circuit, ensures the safety of your devices. Four anti-slip feet stop the charger from sliding. Easy to use: Attach wireless charger to the USB cable, use an adapter (not included) to connect power source. Simply place your compatible devices on the pad then it begins charging, don't need to connect a charging cable every time you charge your phone. If you have any questions about this product by Esicoo, contact us by completing and submitting the form below. If you are looking for a specif part number, please include it with your message.